I believe Tom Marzetta of Bell Labs coined the name "massive MIMO" for the use of 16 or more antennas. I've collected some of the abstracts from Marzetta, a good place to begin your research. In 2015, I wrote: Standards in WiFi and LTE already cover up to 8 antennas, although few if any networks using more than 4 have been deployed. The calculations involved challenge today's most advanced chips. ZTE has a test unit with 128 antennas. Tower has a chip for 256. pCell publically demonstrated a unit of 35 antennas. The biggest obstacle is canceling interference. The calculations needed are far beyond current small computers. pCell needed 3 workstations for a simplified demonstration in a single room with no barriers. Far more processing power will be needed to reach moving phones, walls and windows. Henry Samueli at Broadcom is working on a chip for more than 50 transmitters. ZTE claims a prototype. Beamforming refers to a process of focusing the radio waves so that each receiver is served with a maximum. The technique is decades old but continually being refined. More here. At Marconi webinars I chaired, four distinguished engineers were comfortable predicting 50x better wireless performance. "100x better will be a little harder," one guessed, "but may be possible." I believe that's based on technologies proven in the labs, including M-MIMO, beamforming and interference cancellation. Twenty years ago, Stanford Professor Paulraj predicted MIMO could scale to 100x and even 1000x better performance. Almost no one believed him. I need to write up a better explanation for less technical readers. Suggestions welcome. Meanwhile, below are the conference summary and two abstracts from a 2014 IEEE event and the November 2015 Wikipedia article on MIMO. I will create a separate article for Massive MIMO. Abstract: Massive MIMO, widely considered a promising candidate for the 5G physical layer, makes a clean break with current wireless practice by upsetting the traditional parity between base station antennas and user antennas, and serving every active user in all of the time/frequency resources with aggressive multiplexing based on measured propagation channels. The most elementary multiplexing signal processing can yield order-of-magnitude or better spectral efficiency gains over LTE, power control ensures that users at the edges of the cell experience the same high throughput that users near the base station enjoy, any number of antennas can be employed to advantage with no tightening of array tolerances, and radiated power is reduced in proportion to the number of antennas, which in turn, can translate into hundred-fold gains in total energy efficiency. Massive MIMO arrays need not have large form factors to be extraordinarily effective. Massive MIMO systems are likely to be simpler to operate than LTE systems. Abstract: Massive MIMO (aka very large antenna systems) is a paradigm for which the number of antennas at the infrastructure nodes (base stations) is much larger than the number of data streams transmitted (in the downlink) or received (in the uplink) using spatial multiplexing. Thanks to this large dimensionality expansion, a number of very favorable properties emerge such as (near) optimality of very simple per-cell signal processing, simplified scheduling and improved rate stability due to the channel hardening effect and energy efficiency due to the large beamforming gain. While massive MIMO has been initially studied for i.i.d. (isotropic) fading, in this talk we review a stream of recent work focused on exploiting spatial correlation properties of the channel vectors, due to the fact that large massive MIMO base stations often ‘‘see’’ groups of users and small cells in lower tiers under a small angular spread. We refer to such properties as ‘‘long-term antenna statistics’’, since the second-order statistics of the channel vectors are typically slowly varying in comparison with the small scale fading. Exploiting the knowledge of the channel correlation enables a number of interesting improvements over standard massive MIMO. These include: 1) the ability of eliminating pilot contamination through a multi-cell coordinated pilot scheme; 2) very efficient hybrid digital-analog beamforming implementation; 3) joint space division and multiplexing, with reduced dimension effective channel estimation; 4) inter-cell and inter-tier interference coordination schemes, based on the notion of ‘‘spatial blanking’’ and scheduling compatible beams. In addition, we shall also discuss the application of these schemes to the channel models typical of mmwave communications. This article is about MIMO in wireless communication. For other uses, see MIMO (disambiguation). In radio, multiple-input and multiple-output, or MIMO(pronounced as "my-moh" or "me-moh"), is a method for multiplying the capacity of a radio link using multiple transmit and receive antennas to exploit multipath propagation.MIMO has become an essential element of wireless communication standards including IEEE 802.11n (Wi-Fi),IEEE 802.11ac (Wi-Fi), HSPA+ (3G), WiMAX (4G), and Long Term Evolution (4G). More recently, MIMO has been applied to power-line communication for 3-wire installations as part of ITU G.hn standard and HomePlug AV2 specification. At one time in wireless the term “MIMO” referred to the mainly theoretical use of multiple antennas at both the transmitter and the receiver. In modern usage, “MIMO” specifically refers to a practical technique for sending and receiving more than one data signal on the same radio channel at the same time via multipath propagation. MIMO is fundamentally different from smart antenna techniques developed to enhance the performance of a single data signal, such as beamforming anddiversity. MIMO is often traced back to 1970s research papers concerning multi-channel digital transmission systems and interference (crosstalk) between wire pairs in a cable bundle: AR Kaye and DA George (1970), Branderburg and Wyner (1974), and W. van Etten (1975, 1976). Although these are not examples of exploiting multipath propagation to send multiple information streams, some of the mathematical techniques for dealing with mutual interference proved useful to MIMO development. In the mid-1980s Jack Salz at Bell Laboratories took this research a step further, investigating multi-user systems operating over “mutually cross-coupled linear networks with additive noise sources” such as time-division multiplexing and dually-polarized radio systems. Methods were developed to improve the performance of cellular radio networks and enable more aggressive frequency reuse in the early 1990s. Space-division multiple access (SDMA) uses directional or smart antennas to communicate on the same frequency with users in different locations within range of the same base station. An SDMA system was proposed by Richard Roy and Björn Ottersten, researchers at ArrayComm, in 1991. Their US patent (No. 5515378 issued in 1996) describes a method for increasing capacity using "an array of receiving antennas at the base station" with a "plurality of remote users." Arogyaswami Paulrajand Thomas Kailath proposed an SDMA-based inverse multiplexing technique in 1993. Their US patent (No. 5,345,599 issued in 1994) described a method of broadcasting at high data rates by splitting a high-rate signal "into several low-rate signals" to be transmitted from “spatially separated transmitters” and recovered by the receive antenna array based on differences in “directions-of-arrival.” However, neither patent contemplated the use of co-located antennas at both ends of a radio link in order to exploit multipath propagation. MIMO technology has been standardized for wireless LANs, 3G mobile phone networks, and4G mobile phone networks and is now in widespread commercial use. Greg Raleigh and V. K. Jones founded Airgo Networks in 2001 to develop MIMO-OFDM chipsets for wireless LANs. The Institute of Electrical and Electronics Engineers (IEEE) created a task group in late 2003 to develop a wireless LAN standard delivering at least 100 Mbit/s of user data throughput. There were two major competing proposals: TGn Sync was backed by companies including Intel and Philips, and WWiSE was supported by companies including Airgo Networks,Broadcom, and Texas Instruments. Both groups agreed that the 802.11n standard would be based on MIMO-OFDM with 20 MHz and 40 MHz channel options. TGn Sync, WWiSE, and a third proposal (MITMOT, backed by Motorola and Mitsubishi) were merged to create what was called the Joint Proposal. In 2004, Airgo became the first company to ship MIMO-OFDM products. Qualcomm acquired Airgo Networks in late 2006. The final 802.11n standard supported speeds up to 600 Mbit/s (using four simultaneous data streams) and was published in late 2009. Surendra Babu Mandava and Arogyaswami Paulraj founded Beceem Communications in 2004 to produce MIMO-OFDM chipsets for WiMAX. The company was acquired by Broadcom in 2010. WiMAX was developed as an alternative to cellular standards, is based on the802.16e standard, and uses MIMO-OFDM to deliver speeds up to 138 Mbit/s. The more advanced 802.16m standard enables download speeds up to 1 Gbit/s. A nationwide WiMAX network was built in the United States by Clearwire, a subsidiary of Sprint-Nextel, covering 130 million points of presence (PoP) by mid-2012. Sprint subsequently announced plans to deploy LTE (the cellular 4G standard) covering 31 cities by mid-2013and to shut down its WiMAX network by the end of 2015. The first LTE services were launched in Oslo and Stockholm by TeliaSonera in 2009.Deployment is most advanced in the United States, where all four Tier 1 operators have or are constructing nationwide LTE networks. There are currently more than 360 LTE networks in 123 countries operational with approximately 373 million connections (devices). Precoding is multi-stream beamforming, in the narrowest definition. In more general terms, it is considered to be all spatial processing that occurs at the transmitter. In (single-stream) beamforming, the same signal is emitted from each of the transmit antennas with appropriate phase and gain weighting such that the signal power is maximized at the receiver input. The benefits of beamforming are to increase the received signal gain - by making signals emitted from different antennas add up constructively - and to reduce the multipath fading effect. Inline-of-sight propagation, beamforming results in a well-defined directional pattern. However, conventional beams are not a good analogy in cellular networks, which are mainly characterized by multipath propagation. When the receiver has multiple antennas, the transmit beamforming cannot simultaneously maximize the signal level at all of the receive antennas, and precoding with multiple streams is often beneficial. Note that precoding requires knowledge of channel state information (CSI) at the transmitter and the receiver. Spatial multiplexing requires MIMO antenna configuration. 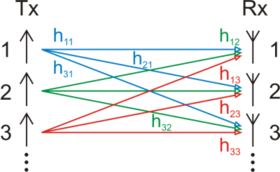 In spatial multiplexing, a high-rate signal is split into multiple lower-rate streams and each stream is transmitted from a different transmit antenna in the same frequency channel. If these signals arrive at the receiver antenna array with sufficiently different spatial signatures and the receiver has accurate CSI, it can separate these streams into (almost) parallel channels. Spatial multiplexing is a very powerful technique for increasing channel capacity at higher signal-to-noise ratios (SNR). The maximum number of spatial streams is limited by the lesser of the number of antennas at the transmitter or receiver. Spatial multiplexing can be used without CSI at the transmitter, but can be combined with precoding if CSI is available. Spatial multiplexing can also be used for simultaneous transmission to multiple receivers, known as space-division multiple access ormulti-user MIMO, in which case CSI is required at the transmitter. The scheduling of receivers with different spatial signatures allows good separability. Single-input single-output (SISO) is a conventional radio system where neither transmitter nor receiver has multiple antennae. In recent 3GPP and WiMAX standards, MU-MIMO is being treated as one of the candidate technologies adoptable in the specification by a number of companies, including Samsung, Intel, Qualcomm, Ericsson, TI, Huawei, Philips, Alcatel-Lucent, and Freescale. For these and other firms active in the mobile hardware market, MU-MIMO is more feasible for low-complexity cell phones with a small number of reception antennas, whereas single-user SU-MIMO's higher per-user throughput is better suited to more complex user devices with more antennas. 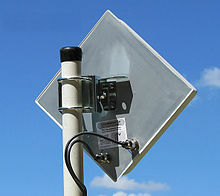 Uses distributed antennas which belong to other users. Massive MIMO is a technology where the number of terminals is much less than the number of base station (mobile station) antennas. In a rich scattering environment, the full advantages of the massive MIMO system can be exploited using simple beamforming strategies such as maximum ratio transmission (MRT) or zero forcing (ZF). To achieve these benefits of massive MIMO, accurate CSI must be available perfectly. However, in practice, the channel between the transmitter and receiver is estimated from orthogonal pilot sequences which are limited by the coherence time of the channel. Most importantly, in a multicell setup, the reuse of pilot sequences of several co-channel cells will create pilot contamination. When there is pilot contamination, the performance of massive MIMO degrades quite drastically. To alleviate the effect of pilot contamination, the work ofproposes a simple pilot assignment and channel estimation method from limited training sequences. MIMO is also planned to be used in Mobile radio telephone standards such as recent 3GPPand 3GPP2. In 3GPP, High-Speed Packet Access plus (HSPA+) and Long Term Evolution (LTE) standards take MIMO into account. Moreover, to fully support cellular environments, MIMO research consortia including IST-MASCOT propose to develop advanced MIMO techniques, e.g., multi-user MIMO (MU-MIMO). The spatial correlation of the channel has a strong impact on the ergodic channel capacitywith statistical information. MIMO signal testing focuses first on the transmitter/receiver system. The random phases of the sub-carrier signals can produce instantaneous power levels that cause the amplifier to compress, momentarily causing distortion and ultimately symbol errors. Signals with a highPAR (peak-to-average ratio) can cause amplifiers to compress unpredictably during transmission. OFDM signals are very dynamic and compression problems can be hard to detect because of their noise-like nature. Knowing the quality of the signal channel is also critical. A channel emulator can simulate how a device performs at the cell edge, can add noise or can simulate what the channel looks like at speed. To fully qualify the performance of a receiver, a calibrated transmitter, such as avector signal generator (VSG), and channel emulator can be used to test the receiver under a variety of different conditions. Conversely, the transmitter's performance under a number of different conditions can be verified using a channel emulator and a calibrated receiver, such as a vector signal analyzer (VSA). Understanding the channel allows for manipulation of the phase and amplitude of each transmitter in order to form a beam. To correctly form a beam, the transmitter needs to understand the characteristics of the channel. This process is called channel sounding orchannel estimation. A known signal is sent to the mobile device that enables it to build a picture of the channel environment. The mobile device sends back the channel characteristics to the transmitter. The transmitter can then apply the correct phase and amplitude adjustments to form a beam directed at the mobile device. This is called a closed-loop MIMO system. For beamforming, it is required to adjust the phases and amplitude of each transmitter. In a beamformer optimized for spatial diversity or spatial multiplexing, each antenna element simultaneously transmits a weighted combination of two data symbols. A textbook by A. Paulraj, R. Nabar and D. Gore has published an introduction to this area.There are many other principal textbooks available as well. Mobile Experts has published a research report which predicts the use of MIMO technology in 500 million PCs, tablets, and smartphones by 2016.